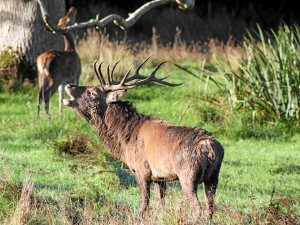 The Kerry Deer Society formed in 1970, following growing concerns about the possible extinction of Red Deer in the Killarney National Park. The newly formed Society met the then Park Management and Department Officials to express their fears and a management plan was drawn up and put into operation. With the combined efforts of the Kerry Deer Society and the Park Rangers the herd numbers have now come back to a respectable 650 (approx.) between mountain and woodland areas. Conservation measures now in operation include the translocation of some of the Killarney Red Deer to Innishvickillane Island off the Kerry coast and to the Connemara National Park. Stock would be available from these herds to restock if hybridisation or disease should occur in the Killarney area. The Kerry Deer Society is affiliated to the Irish Deer Society and new members are always welcome and please do not hesitate to contact us directly or through the Irish Deer Society. You can help to protect our heritage for the future by obeying the any notices in relation to deer management in the National Park and outside.